Do you like silence? At last there is a solution! Sigao Fanless Industrial Grade with heatpipe cooling of CPU and chipset. Protection from water spray and dust. Suitable for Industrial & Business users. Supports 6-Core Coffee Lake i7 CPUs. User-accessible ultra fast PCIe SSD + Up to 4x SDD/HDD. Option for PCIe expansion cards. FC8-Series Stylish 4mm thick sandblasted aluminium case, with heatpipe cooling of CPU. Up to 4x SSD/HDD including 3.5" HDD. TX-Series Top performance from 8th Gen Six Core CPUs and ultra fast Solid State Disk. 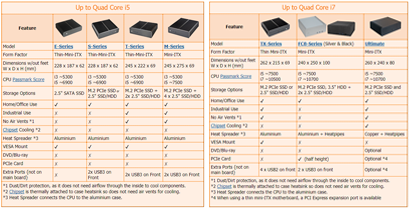 M-Series, T-Series, S-Series, E-Series Great value solid aluminium fanless PCs. With 7th Gen and 8th Gen models. Suitable for Business, Office and Home users. M-Series up to 5 x SSD/HDD. T-Series up to 3 x SSD/HDD. S-Series and E-Series support 1 x SSD. All models support VESA mounting on monitors. Fanless Intel NUC Based on the intel NUC miniature PC family. Variety of models suitable for Industrial, Office and Home users. CPUs from entry level up to Core i5. Up to 2 x SSD/HDD.